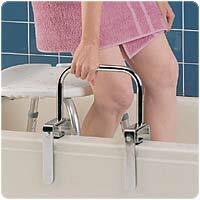 Provides extra support when getting into or out of the bathtub. Spring steel clamps adjust to fit a variety of tubs. Rubber pads line the clamps to help protect your tub. Chrome finish helps prevent rust.